​SAN DIEGO - At $79.3 million, the Atmosphere housing complex is one of the most expensive subsidized housing projects in downtown San Diego. The 12-story downtown building has 205 apartments with a price tag of $386,000 per unit. That’s about $166,500 more than the average cost to buy a San Diego County apartment, said Marcus & Millichap’s latest multifamily research report. Monthly rent at Atmosphere will range from $525 to $1,250 for families or individuals who earn $17,000 to $48,000 a year. “Atmosphere is a perfect example, ladies and gentlemen, of what we need to build all over San Diego — in every single neighborhood across the city,” said Mayor Kevin Faulconer at the opening ceremony Wednesday on the building’s rooftop terrace. Atmosphere developer Wakeland Housing & Development Corporation cut off applications at 1,000 for the complex, and then families and individuals were chosen via a lottery. Fifty-one apartments are set aside for the recently homeless. Wakeland CEO Ken Sauder said the per unit cost of the 218,000-square-foot complex ensures a 55-year lifespan and the steel-frame building includes three floors of underground parking for residents who need transportation for work. He said a lot of the people living in the building are service workers who will be close to downtown jobs, and it is also close to services for the recently homeless. He said costs for subsidized housing are higher downtown than other parts of the county, but many residents don’t have the luxury of living far from their jobs. He said the costs include money to make sure the building is well maintained and for effective tenant screening. Atmosphere is in a pricey neighborhood where the average asking rent per unit is $1,859, said real estate tracker CoStar. The complex was financed by a variety of sources: $44 million in low-income housing tax credits; $11.6 million loan from city redevelopment agency Civic San Diego; $3.1 million in state “infill” funding programs; $3.5 million through the state Mental Health Services Act (from San Diego County); $3 million from the San Diego Housing Commission, $1.7 million in deferred fees; a $8.7 million bank loan, and other smaller sources. Each tenant pays rent, in varying amounts, with federal Section 8 housing vouchers. The project was in development for 10 years. Construction began in March 2015 and finished in April shortly before residents began moving in. 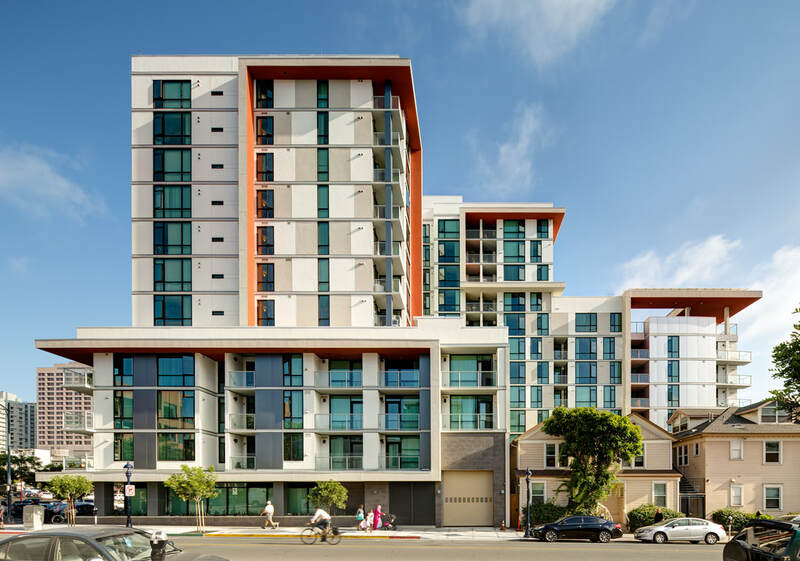 It was designed by Joseph Wong Design Associates, a San Diego-based firm that designed the Hilton San Diego Bayfront Hotel and the upcoming 279-unit Pacific Heights apartment building downtown. There is no limit to how long a resident can stay. As long as residents stay income-qualified, they could hypothetically rent at Atmosphere until their death. An incentive to get a better job may not change their income qualification in San Diego’s high-priced rental market, Sauder said. For many new residents, Atmosphere represents a new start after years of struggle. Vikki Lozano, 61, and her husband, Ted, 72, lost everything in the Great Recession. The couple had owned five retail locations that specialized in window coverings and interior design, at one point designing comedian Eddie Murphy’s Sacramento area home. When the housing bubble burst, they found their business going under, they lost their El Dorado Hills home and went through almost all of their savings in a matter of months. The Lozanos moved to San Diego County to be close to their son and get their lives back on track. A lot of health problems followed — Parkinson’s disease for Ted Lozano (he just had brain surgery last week) and two heart tumors for Vikki Lozano. Meanwhile, they moved from apartment to apartment, unable to keep up with rent increases. Vikki Lozano eventually persuaded her husband to apply for housing assistance, picturing it would be a dump. To say the least, the Lozanos are thrilled with their 1,000-square-foot, two-bedroom apartment in Atmosphere. They have a balcony that faces the Symphony Towers and San Diego Union-Tribune buildings, sheet vinyl flooring that looks like hardwood and is easy to clean, and enough room for their 9-year-old dog, a Maltese and poodle mix named Linus. Their rent is $1,100 a month. The building comes with plenty of resources to help residents, including a computer lab, communal kitchen, rooftop deck, courtyard, laundry facilities and a children’s play area. Services will include after school programs for children, as well as job readiness and computer classes for adults. Other recent subsidized housing developments downtown have had similar price tags. The 17-story Celadon complex that opened in May 2015 cost $76 million ($304,000 per unit) for 250 apartments. The 6-story Cedar Gateway Apartments that opened in March 2012 cost $33 million ($507,692 per unit) for 65 apartments. The 6-story Alpha Square development opened in January 2016 and cost $47.6 million ($234,483 per unit) for 203 apartments.